بخش زیادی از آلاینده‌های موجود در صنعت آلاینده‌های آلی هستند که در برابر تصفیه بیولوژیکی مقاومت بالایی از خود نشان می‌دهند. استفاده از روش‌های اکسایش پیشرفته راه حل مناسبی برای از بین بردن این نوع آلاینده‌ها است. در این پژوهش، ماده رنگزای آلی طی فرایند فنتون هتروژن داخل راکتور بستر سیال حذف شد. استفاده از این نوع راکتور به‌دلیل بالا بودن میزان آشفتگی و در نتیجه میزان انتقال جرم، تأثیر بالقوه‌ای در حذف آلاینده‌ها طی فرآیند فنتون هتروژن دارد. کاتالیست مورد استفاده سنگ طبیعی پیریت بود که به دلیل داشتن ویژگی‌های فراوان اعم از سازگار بودن با محیط زیست و کم هزینه بودن، می‌تواند در فرایندهای اکسایش پیشرفته بسیار مورد توجه قرار گیرد. 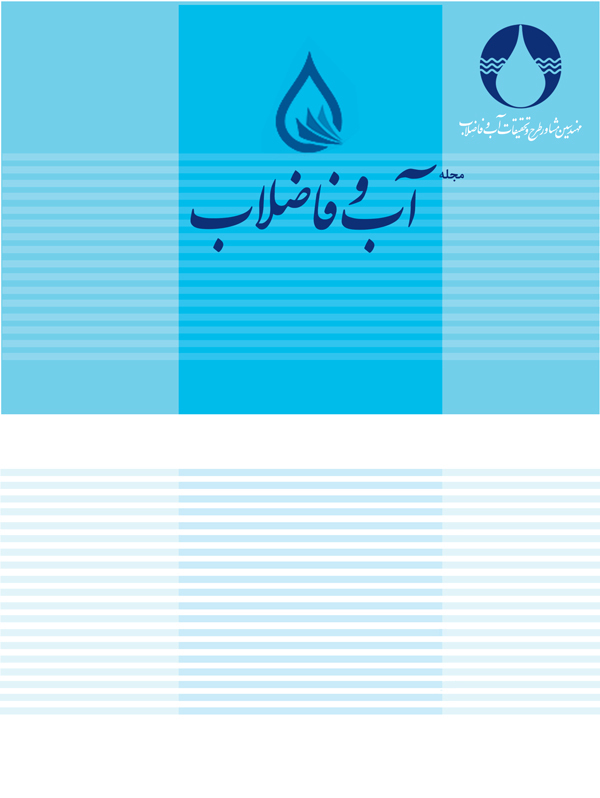 در ادامه این پژوهش، مدل‌سازی فرایند و حل عددی مدل به‌دست آمده با روش دینامیک سیالات محاسباتی، انجام شد. نتایج حاصل از مدل ارائه شده از لحاظ هیدرودینامیکی فرایند و هم‌چنین از لحاظ شیمیایی (واکنشی آن)، با نتایج عملی تطابق قابل قبولی داشت. در ادامه، برای پی بردن به تأثیر هیدرودینامیک سیستم بر روی سینتیک فرایند، مطالعه سینتیکی غیر وابسته به معادلات انتقال مومنتم و جرم، انجام شد. نتایج نشان داد که به‌علت کم بودن نرخ اتلاف گردابه‌ای برخی اجزا نسبت به نرخ سینتیکی، نرخ اتلاف گردابه‌ای به‌عنوان کنترل‌کننده واکنش عمل می‌کند و بنابراین نتایج دینامیک سیالات محاسباتی نسبت به نتایج مدل‌سازی سینتیکی به نتایج عملی نزدیک‌تر است. Organic contaminants in industrial wastewater are mostly non-biodegradable, so advanced oxidation processes (AOPs) should be used as a promising alternative for conventional treatment processes. In this investigation, degradation of an organic dye was studied in a fluidized bed reactor, using Fenton heterogeneous process. Application of fluidized bed reactor in this process makes it more effective because of high mass transfer and turbulence rate. Pyrite is a natural mineral ironstone which is abundant on earth and is known as a sustainable catalyst for AOPs. In the first part of this study, computational fluid dynamics (CFD) simulation was prepared, which showed a good agreement with the experimental results in dye removal efficiency and hydrodynamics of the reactor. In the second part of the study, a kinetic model was developed for evaluating the hydrodynamic effects on the heterogeneous Fenton reaction in a fluidized bed reactor. Unlike the CFD model, the provided kinetic model does not contain the momentum and mass transfer balances. The CFD results were more similar to the experiment results than the kinetic model. It showed that some of the components that were involved in this process had smaller eddy dissipation rate compared to the kinetic rate. Aghdasinia, H., Arehjani, P., Vahid, B. & Khataee, A., 2016(a), "Fluidized-bed fenton-like oxidation of a textile dye using natural magnetite", Research on Chemical Intermediates, 42(12), 8083-8095. Aghdasinia, H., Bagheri, R., Vahid, B. & Khataee, A., 2016(b), "Central composite design optimization of pilot plant fluidized-bed heterogeneous Fenton process for degradation of an azo dye", Environmental Technology, 37(21), 2703-2712. Andreozzi, R., Caprio, V., Insola, A. & Marotta, R., 1999, "Advanced oxidation processes (AOP) for water purification and recovery", Catalysis Today, 53, 51-59. Babuponnusami, A. & Muthukumar, K., 2014, "A review on Fenton and improvements to the Fenton process for wastewater treatment", Journal of Environmental and Chemical Engineering, 2, 557-572. Barhoumi, N., Oturan, N., Olvera-Vargas, H., Brillas, S., Gadri, A., Ammar, S. & Oturan, M.A., 2016, "Pyrite as a sustainable catalyst in electro-Fenton process for improving oxidation of sulfamethazine. Kinetics, mechanism and toxicity assessment", Water Research, 94, 52-61. Garrido-Ramírez, E.G., Theng, B.K.G. & Mora, M.L., 2010, "Clays and oxide minerals as catalysts and nanocatalysts in Fenton-like reactions — A review", Applied Clay Science, 47, 182-192. Ghafoori, S., Mehrvar, M. & Chan, P.K., 2013, "Photoassisted Fenton-like degradation of aqueous poly (acrylic acid): From mechanistic kinetic model to CFD modeling", Chemical Engineering Research and Design, 91, 2617-2629. Gogate, P.R. & Pandit, A.B., 2004, "A review of imperative technologies for wastewater treatment I: Oxidation technologies at ambient conditions", Advances in Environmental Research, 8, 501-551. Langford, K.H., Reid, M. & Thomas, K.V., 2011, "Multi-residue screening of prioritised human pharmaceuticals, illicit drugs and bactericides in sediments and sludge", Journal of Environmental Monitoring, 13, 2284-2291. Ledakowicz, S. & Gonera, M., 1999, "Optimisation of oxidants dose for combined chemical and biological treatment of textile wastewater", Water Research, 33, 2511-2516. Lee, W. & Batchelor, B., 1999, "Abiotic reductive dechlorination of chlorinated ethylenes by iron-bearing soil minerals. 1. pyrite and magnetite", Environmantal Science and Technology, 36, 5147-5154. Versteeg, H. & Malalasekera, W., 2007, An introduction to computational fluid dynamics the finite volume method, 2nd Ed., Pearson Education. U.K.